Remember, remember the 5th of November. More remembering today. Just of a very different kind. Not so much a London thing as an English thing. And wow do the English have some crazy customs and traditions. Today being perhaps the most baffling of all, to a foreigner. For today is Guy Fawkes Night, or more recently Bonfire Night. And what happens on this evening?, you ask. 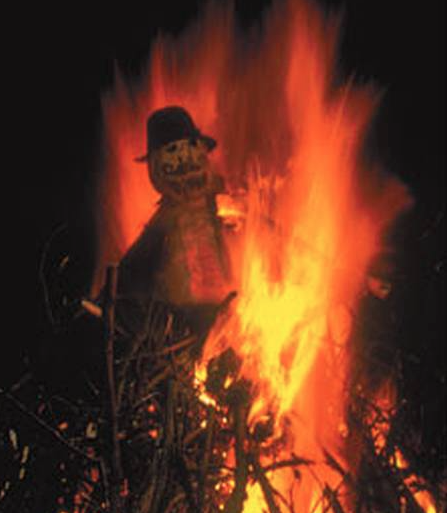 Well, an enormous bonfire is built and lit, an effigy of “Guy” is made from old clothes and appropriately flammable materials and tossed on the bonfire. Then follows a fireworks display. Fun for the whole family. Wait, wait, wait, I hear you, the bemused outsider (BO) calling, you make a “Guy” and burn him??? LP: Well (the quick & simple version) because back in the year 1605 a Catholic by the name of Guy Fawkes thought it an excellent idea to try and blow up the Houses of Parliament and kill (Protestant) king James I. His plot failed as he was ratted out, possibly by his co-conspirators. Mr. Fawkes was captured, tortured and then hanged, drawn and quartered (pretty awful). The others involved were executed in St. Paul’s churchyard. Most likely, Guy was only the fall guy (ha ha ha) not the brains behind the operation, and like all good historical yarns, this one has more sub plots and conspiracy theories than you can wave a sparkler at. Regardless, this near miss is marked each and every year in the above described manner. BO: And this is a celebrated holiday? LP: Yes. A tradition most revered. I expect all of my English friends to fill the comment box with tales of ages past when they used dear grandfather’s clothes to make their own Guy and wheeled him round the streets receiving coins from neighbours for their troubles. LP: Bonfire Nights have become a big business for local governments. They spend the calendar year planning the event. In my area, the local private schools get together and put on their own display on the Friday closest to the 5th. I am in charge of selling tickets. I can’t believe drug dealers have a more rabid and desperate clientele than me. Tonight I will attending a friends lavish Bonfire Night party…South of the Border has nothing on the fireworks display our local Mr. C puts together. Drinks will be served, children will be narrowly rescued from flames and everyone will have a very jolly time. Another amusing custom is that of bringing grapes to someone in hospital. Magazines, yes I can see the point. A fruit that needs to be washed, not so much. I have no idea where this practise comes from. I hope someone will tell me. 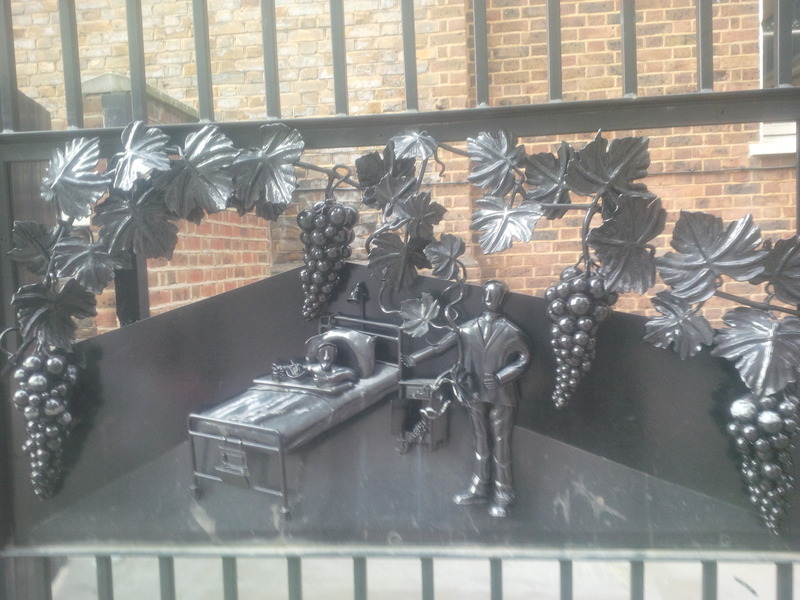 The other week I found this fantastic bit of sculpture on the railings of St. Guy’s Hospital in London. The poor man has received so many bunches of grapes that his hospital room has been transformed into a vineyard. So clever. And so typically self-deprecating. And one more wonderful English custom: “the piss take,” or the national sport of mockery. There is almost nothing the English can’t laugh at, most of all themselves. Oh London, you really do have it all: burning catholics, unnecessary grapes and the strength of character to know when something is ridiculous and love it anyway. One of the many things that my wonderful London does well is the Grand Gesture. Think back to the Olympics and the Diamond Jubilee….happy people as far as the eye could see. And London has done it again with these poppies. I know, I know, the poppies around the Tower is probably the most shared photo on FB at the moment, in the UK anyway, but for good reason. This installation is sensational. And moving. And just plain beautiful. Definitely something that any of you who can physically get to the Tower MUST, MUST see. Yes, I too have heard the reports that it has gotten so crowded people are being encouraged to stay away, but go, go, even if that means you go at dawn. Then as you look down on those waves of red, remember that every single one of the (to be) 888, 246 ceramic poppies represents a life lost by a member of the British military in WWI. The Great War. The War to end all wars. Wow, we’ve done a spectacularly bad job of that. True, true. But the other half of that evil coin is that we forget. So we haven’t eradicated war, quite the opposite it feels today, but “Lest We Forget” has been proven unfounded. 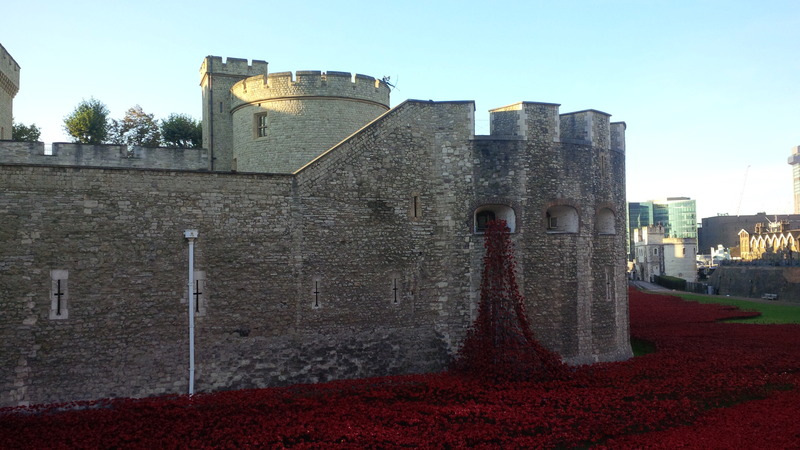 If you really want a heartwrenching treat, squeeze yourself there for the Roll of Honour. Originally planned as a weekly event, the response was so immediately overwhelming the ceremony is daily, starting now from 16:55. But you will need to get there early. Names are read. 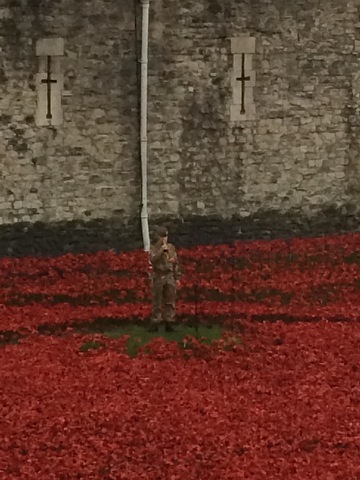 The Last Post is played. Collective breath is held. And then those gathered feel emotionally drained, yet uplifted. Reminded that sacrifice and honour still matter in this cold, selfish world. 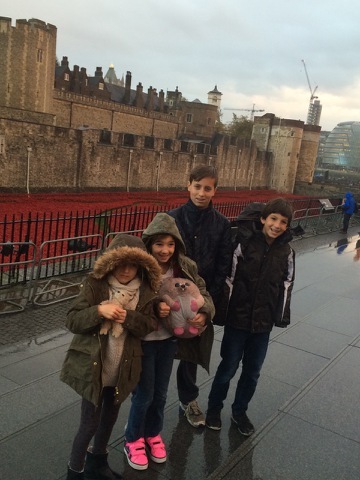 The Poppies at the Tower. My London Passion 1/100. There until 11 November only. Waiting for the Roll of Honour to begin, in the rain.